Combos, combo breakers, reversals, air reversals, quarter-circle forward fierce — fighting games have become so obfuscated by increasingly complex controls and move sets that it takes hours of study and pages of notes just to become remotely competitive. Layer in dozens of characters with their own play styles, as well as numerous additions made by “Hyper” and “Ultra” add-ons, and it’s easy to lose sight of what makes them great in the first place: the psychological back-and-forth of two players pitted against each other in mortal combat. Nidhogg takes all of the fat built up inside the fighting genre over last few decades and strips it away; what’s left is the one of the purest, most entertaining one-on-one combat games in years. Nidhogg looks and sounds like an Atari game drenched in LSD. With a soundtrack by renowned electronic producer Daedalus that’s equally ambient and driving, shifting multicolored backdrops that look like an acid trip gone horribly wrong (or fantastically right; your call), and the crunchiest 8-bit character design this side of the “dragon” from Adventure, Nidhogg is a clear throwback to the games of the past. Despite this decidedly retro aesthetic, Nidhogg features some the most masterfully animated pixels I’ve ever seen. From the showers of pixelated blood that explode from fallen enemies to the massive chandelier that sways to and fro in a massive castle, to deftly cartwheeling over your sword to grab it off the ground, Nidhogg’s unique visuals combine the best of modern technology with the nostalgia of yesteryear. Like a weird combination of Karateka and Bushido Blade, Nidhogg adds an interesting spin to the conventional 2D fighter. Each arena stretches across seven different “screens,” with you and your opponent dropped in the middle screen at the start. You’ll use your rapier, a handful of martial arts moves, and your wits as you try to slay your foe. Once defeated, a giant “GO” sign appears like something straight out of Golden Axe, granting you the advantage on the battlefield. Your goal is to make it across three additional screens, where you’ll be greeted by a cheering crowd, as well as the titular Yggdrasil-gnawing dragon. Don’t worry, being eaten by Nidhogg is an honor; one should be so lucky. Meanwhile, your opponent is trying to do the same thing. There’s a constant push and pull in matches, and they can easily go from sure-fire victory to utter defeat in the span of a few seconds. The controls help make each match as nail-bitingly tense as possible. You have a limited set of moves, but they allow for a nearly infinite amount of strategy. Raise or lower your rapier, divekick your opponent, or chuck your sword at full speed — there’s a lot of depth within the limited control set, and button mashing will get you nowhere. Swords also operate independent of their user, and careful players can get in close and whip their opponent’s weapon right out of their hands. You’ll die frequently, but you’ll grit your teeth, mutter a curse word under your breath, learn from your mistakes, and press on. Battles are frantic, but most importantly, they’re fair. There are four arenas to choose from, each one adding its own set of wrinkles to the already stellar combat. The mines are filled with confining corridors preventing jumping and sword throws, and conveyor belts that can send you careening into a bottomless pit. Fighting in the clouds can obstruct your vision, or send you plummeting to your doom if you aren’t careful. The wilds host multiple levels of platforms and stance-obscuring tall grass. Lastly, the castle holds numerous rooms and choke points to bait your opponent into losing their sword. Each arena allows for numerous strategies and endless replayability. As good as the maps are, and as deep as the combat is, I can’t help but wish for more, especially for solo play. There’s a simplistic arcade mode that pits you against increasingly more difficult AI fencers in each of Nidhogg’s four arenas, but multiplayer is the clear focus. Surprisingly for an indie title, Nidhogg features online multiplayer which actually works pretty well, though there are few people currently playing online at the moment. No, the main draw here is local multiplayer, and while there aren’t as many options as your typical fighting game, battling in Nidhogg is so entertaining that its arcade-like simplicity is enough to carry it through match after match after match. Variations like boomerang swords and turbo mode add several layers of insanity to a game already abundant with it, and a tournament mode allows multiple competitors the chance to fight for the opportunity to be eaten by a giant worm-dragon. This is a game that was clearly designed to have you get a bunch of friends together, grab a few beers, and scream profanity at one another. As games get more and more complex, adding more moves, characters, and convoluted online multiplayer suites, it’s exciting to see a team take the thrill of the showdown and distill it down to its purest essence. Even if it’s fairly light on content, the purity of its combat and the fluidity of its controls ensures that Nidhogg will be gracing tournaments and frat parties alike for years to come. 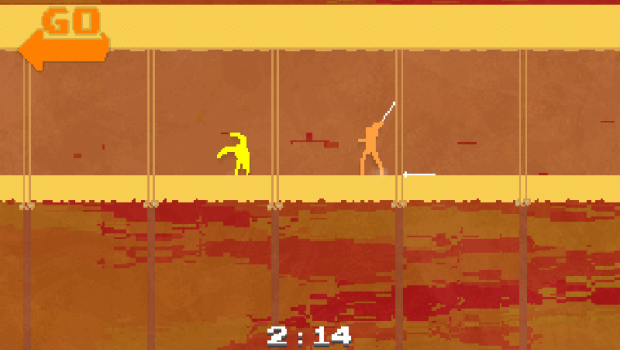 Nidhogg is the 8-bit Bushido Blade demake we never knew we wanted, offering up a sublime one-on-one fencing experience like no other. I just wish we got more.